"Gobboboy", aka Jimmy Fricke, has been a very successful poker player (most online) for some time now, but he really came into his own when he decided to venture out of the US and play some live events, most notably at the Aussie Millions and the PCA this year. After a strong performance at the PCA, Fricke placed second at the Aussie Millions, absolutely running over the table until he was bested by Gus Hansen. Fricke made over a million dollars Australian for his second place finish. Like I said before, Fricke had been successful (very successful) playing online poker before his two big live finishes. The scary thing about Fricke is that he is still a teenager, still too young to be allowed to play at the World Series of Poker. What makes him so good? 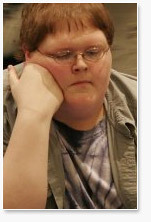 If you witnessed his play at the Aussie Millions, it was obvious to see why Gobboboy is feared. It's his aggression, and his willingness to commit his entire stack with a marginal hand, if he believes he is ahead and has a good read on his opponent. Gobboboy is an extremely punishing player, constantly putting pressure on his opponents, making them fold hands when they are actually ahead. Gobboboy is known for his tie-died shirts and somewhat cocky manner in which he addresses his opponents. Gobboboy seems to be spending more time at the cash tables as of late, playing Pot Limit Omaha. The two times that I have watched him play cash, he has had 7+ buyins at the table. Cash or tournaments, Gobboboy seems to excel at whatever he decides to play. Jimmy Fricke is definitely a name to keep an eye on in the future, you can expect more scores from him.